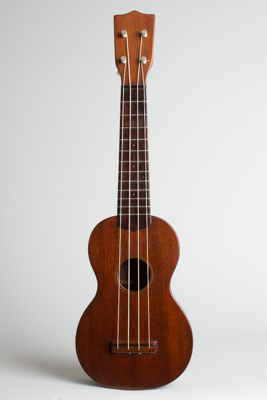 Varsity Brand Style 0 Model Soprano Ukulele, made by C. F. Martin, c. 1923, made in Nazareth, PA, natural varnish finish, mahogany body and neck, rosewood fingerboard, black hard shell case. This is a very nice-playing example of an early Martin Style 0 ukulele, slightly unusual in that it is marked only with the jobber brand "Varsity" with no other markings or stamps. Martin made a number of custom-branded lines for different re-sellers in the early '20s, and though most were hot-stamped with the seller's brand, some (like this one) were only branded with a sticker, in this case on the back of the headstock. And, yes, this is definitely a Martin and not a knockoff...even the close ones are easy enough to tell apart! Although the Style 0 was C. F. Martin's least expensive instrument ever (originally retailing in the $10-$12 range), it is still built to the high standards of all Martin instruments -- even the jobber brand ones! Martin ukuleles, especially the early models, are still considered amongst the best-sounding and playing ukuleles ever manufactured. The all-mahogany Style 0 is the simplest design, and while devoid of ornament except its little gold "Varsity" sticker, still has as beautiful a tone as most any Martin uke. Overall length is 20 3/4 in. (52.7 cm. ), 6 3/8 in. (16.2 cm.) wide at lower bout, and 2 1/4 in. (5.7 cm.) in depth at side, taken at the end block. Scale length is 13 5/8 in. (346 mm.). Width of nut is 1 3/8 in. (35 mm.). This uke is a nice-playing original example, with a couple of changes and a bit of wear. The body only appears to have gotten a very light French polish overfinish long ago, some of which is worn through in the heavily-strummed area under the strings up near the fingerboard. This finish is shinier than the original Martin varnish and a bit uneven in spots but is still attractive enough and not heavy enough to affect the sound, which remains lovely. The tuning pegs are later examples of the old Grover-style metal friction units with plastic buttons; this uke would have originally had violin-style pegs and is now somewhat more player-friendly to tune as a result. There are some small dings and dents but no visible cracks or repairs. The uke plays perfectly and sounds simply swell, as they would have said when it was new. A lovely instrument and an interesting example of Martin's 1920s custom-brand experiment, which did not last long. It's also a testament to how well C.F. Martin & Co. built everything they sold -- even the ones they didn't put their name on! Very Good + Condition.